AT&T is making a set of mobile applications available for its U-verse customers with the goal of making watching TV a more social experience. With the rise of mobile devices, the simple act of catching your favorite shows has changed, and according to Nielson, 30 percent of viewers look up info related to a TV program while they're watching it. AT&T wants to blend the social, multitasking and TV watching experience into one by offering four different apps capable of providing real-time TV content and social features, if you own a qualifying smartphone or tablet. BuddyTV Guide, which provides personalized recommendations, a customizable TV guide, show reminders and real-time commenting as well as extra content on your mobile device based on what you're watching on TV. 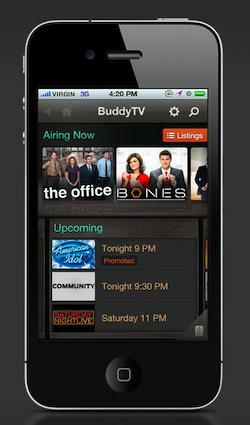 From BuddyTV Guide, you simply tap to tune into a show on your AT&T U-verse receiver. Miso (gomiso.com/uverse), which lets you easily share what you're watching, discover new shows based on what your friends watch and get cool information about your favorite shows. TV Foundry, will let you search for shows, trailers, interviews, songs and companion content, show it on the big screen and share it with friends via Facebook and Twitter. Wayin, which allows you to share opinions with other Wayin community members as you post and receive photos and questions about the shows that you are watching. Wayin is able to understand the television program that you are watching and changes with you as you change programs. Because the U-verse service is 100 percent Internet-based protocol television (IPTV), users connect to their home network through channel 9301. Once connected, the different apps will provide social feeds and information based on what they're currently watching. Customers want their TV viewing experience to be social, without distracting from the TV show on their TV screen, and they want their choice of apps from their smartphone or tablet to work seamlessly with their TV and enhance their favorite TV shows, said Jeff Weber, vice president of video services, AT&T Mobility and Consumer Markets. These apps allow you to interact and share details about the shows you're watching in simple and engaging ways. And you can do that on the devices that are in your hands or right next to you on the couch. Are you pining for a more social TV watching experience? Or have you had enough with all the different social apps?